A must-have for any Mexican meal! This fresh, delicious chunky guacamole is loaded with fresh avocados, tomatoes, onions and the perfect spices. You’ll want to put this guacamole on everything! I don’t know about your household, but Mexican food is definitely a staple here at our house. Any time we’re having something like tacos, enchiladas, or fajitas, there is ALWAYS guacamole to go with it. For the longest time, I was one of those people at the grocery store buying the little tiny container of guacamole for $3.99. Not only was it rather expensive, it didn’t taste that great. This home-made Loaded Guacamole tastes way better! Once I discovered how easy it was to make this Loaded Guacamole at home, there was no more buying that mediocre stuff at the store. Not to mention, when you’re making something at home, you know exactly what’s going into it. 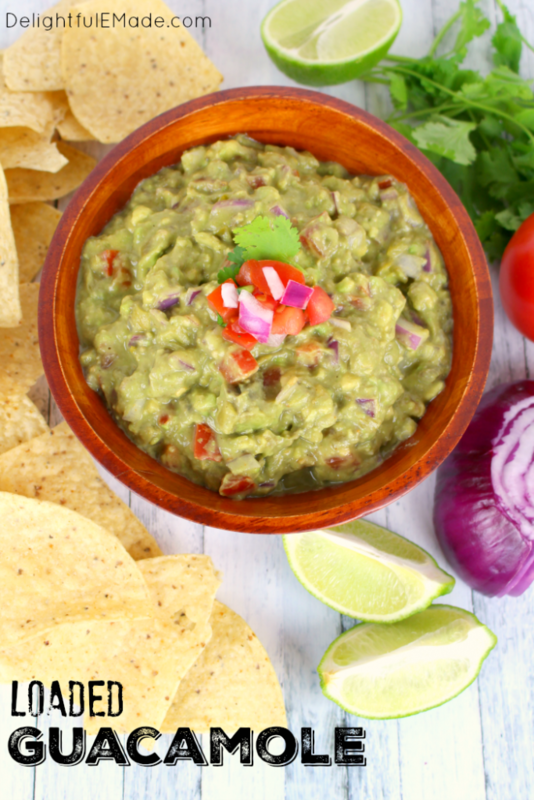 The Loaded Guacamole has nothing but fresh ingredients along with some simple spices that you can easily find, making it Clean-Eating friendly! 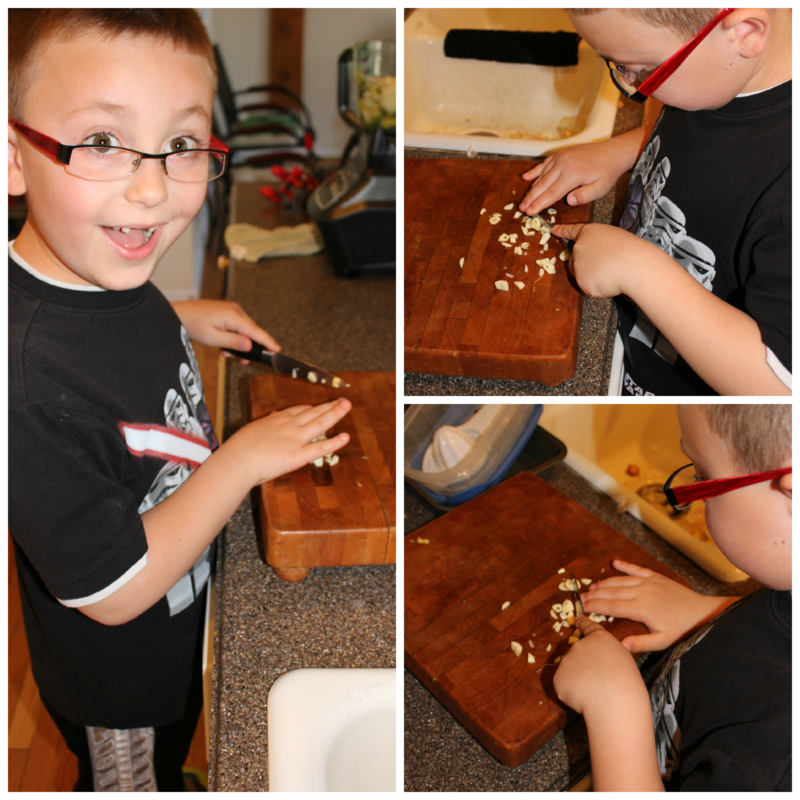 Harrison helping with chopping garlic. 🙂 My little sou chef. To get my 6-year-old fella to eat more veggies, I’ve come to notice that if he is there helping me prepare what we’re eating, he is much more apt to try and LIKE it! So I got him chopping away – he helped chop and prepare almost everything – the avocados, garlic, onion, lime juice, chilies, spices and tomatoes. I really love a chunky guacamole, where you have bits and pieces of onion, avocado, garlic and tomato. To make a chunky guacamole, simply chop up your ripe avocados as you would all of your other ingredients. You can also pulse your food processor (or blender) just a few times – it will incorporate and break everything up, but still remain chunky. 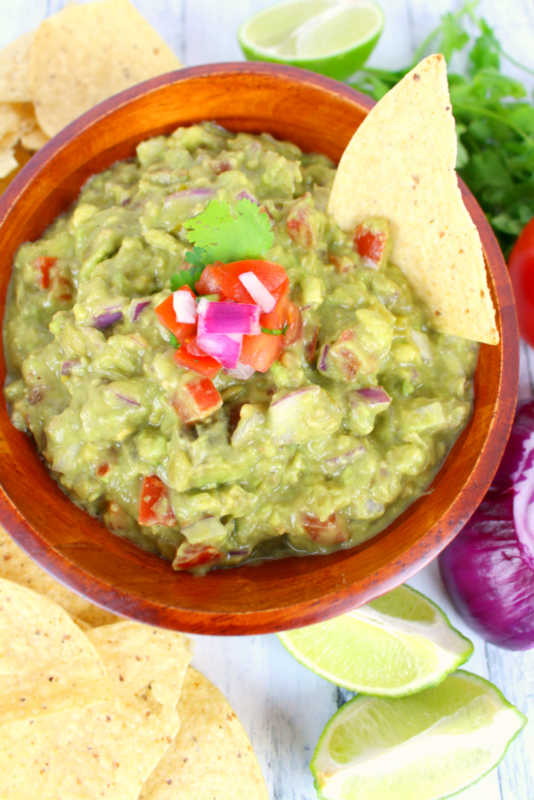 This guacamole is definitely perfect for Cinco de Mayo! 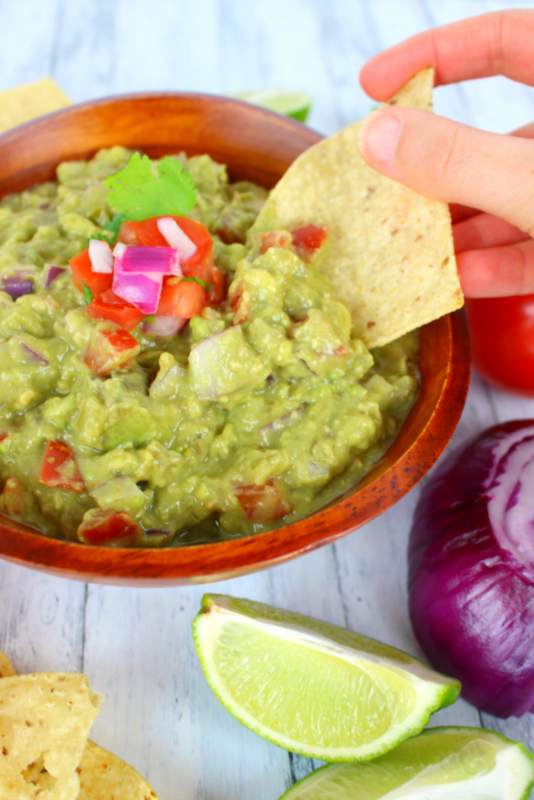 You'll never buy guacamole at the supermarket again! 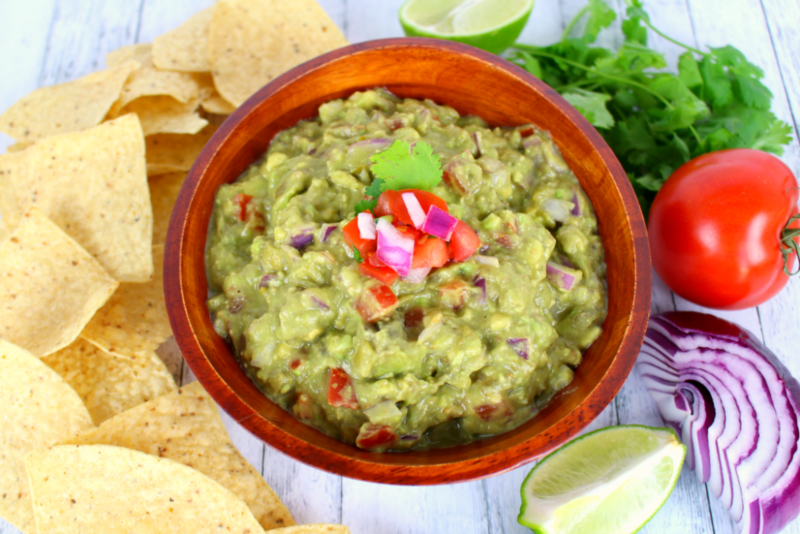 This fresh, easy and delicious Loaded Guacamole has everything that you love about Mexican food - fresh, spicy and loaded with flavor! Chop the avocados, onions, and garlic. Combine in a mixing bowl. (For a creamier guacamole, puree for a few seconds in a food processor.) Stir in the lime juice, chili pepper, garlic salt and cumin and cayenne pepper. Enjoy right away. 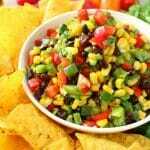 Serve with tortilla chips and fresh vegetables. 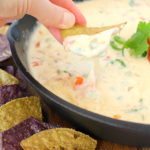 Top your favorite Tex-Mex foods like nachos, burritos, tacos and enchiladas. Refrigerate in an air-tight container for up 5 days. *If you’re rather strict on clean eating, you can fire-roast your own chili pepper at home, simply by roasting over an open burner until the skin blackens. Once cool, peel off the blackened skin, and you’ll have a deliciously roasted chili pepper. 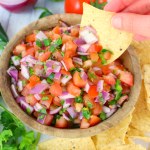 **If you don’t have fresh chili peppers readily available in your produce section, you can find canned chopped chili’s in Mexican food section of the supermarket, near the salsa. I use these often, and are a good sub when needed. This post is the third of four post that is a part of the 2014 Clean Eating Challenge. 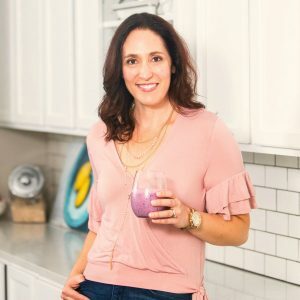 Me and other fantastic food bloggers will be bringing you some great Clean-Eating friendly posts, and hopefully some additional ideas to help you eat cleaner, and fresher in the future! 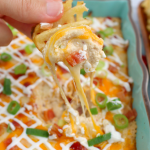 This is the perfect Cinco de Mayo treat! Love it! Erin, this guacamole looks awesome! And I love that you made it into a family party with everyone chopping--so fun! This looks good! And your son is adorable! :) I have never found a store-bought guacamole that I like, so I make it all the time. I'll have to try roasting my peppers next time! Thanks for sharing on Create Link Inspire! 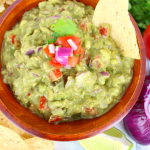 Who doesn't love a great guacamole recipe?! Thank you for sharing yours with us at Snickerdoodle Sunday! Pinned and tweeted :) Hope you have a fabulous week! 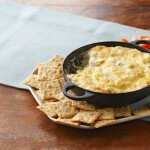 Time for chips and dip!! Thanks for sharing on the "What's for Dinner" linky! I love cumin and never thought to add it to guacamole. Sounds delicious! I have a guacamole addiction (I think). My husband knows one of the most romantic things he can do for me is pick up a pint (of guacamole :) from the local Mexican restaurant on his way home from work. Your photos are enticing and I hope to make my own soon. Thank you for sharing! Yum, yum, yum. it's time for a party at your house! Happy Cinco de Mayo - wanted to drop by and let you know I'm featuring your recipe this week on #FoodieFriDIY - come back for the party! 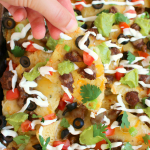 Perfect for Taco Tuesday or Cinco de Mayo this week! This post is a Feature for the new Merry Monday party! Looks amazing. Pinned & sharing Thanks for joining the Inspiration Spotlight party.